Democrats opened their national convention Monday in Philadelphia looking to put behind them a contentious primary season with some of their biggest voices uniting behind their presidential candidate Hillary Clinton. Vermont Senator Bernie Sanders, who finished second to Clinton in the Democratic race, said the country needs leadership that brings people together instead of insulting Latinos, Muslims, women, African-Americans and veterans. Massachusetts Senator Elizabeth Warren said Trump and his campaign have embraced keeping the powerful on top, as well as racial hatred, bigotry and attacks on women and immigrants. 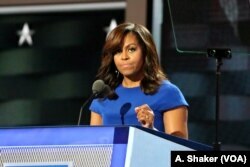 First lady Michelle Obama drew huge cheers from the crowd as she spoke about the importance of those in the White House serving as role models to the nation's children, saying that "our words and actions matter" and that she believes Clinton is the only person qualified to be the next president. "I want a president with a record of public service, someone whose life work shows our children that we don't chase fame and fortune for ourselves, we fight to give everyone a chance to succeed," Obama said. "I want a president who will teach our children that everyone in this country matters." She made several apparent references Trump without mentioning his name, including saying a president cannot have a tendency to lash out and needs to be steady and well-informed. Trump In addition to tweeting about Sanders and Warren, Trump posted a message about a speech by New Jersey Senator Cory Booker. But absent were any words about Obama's speech, a week after Trump's wife Melania spoke at the Republican National Convention with a passage very similar to one Obama delivered in 2008. 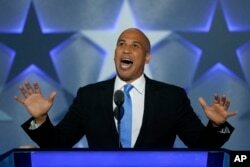 Sen. Cory Booker, D-NJ., speaks during the first day of the Democratic National Convention in Philadelphia , July 25, 2016. From left, Republican presidential candidate Donald Trump speaks to supporters at Mar-a-Lago Club in Palm Beach, Fla., while Democratic U.S. presidential candidate Hillary Clinton speaks at a rally in West Palm Beach, Florida, March 15, 2016. Clinton's husband, Bill, a former U.S. president, is addressing the convention on Tuesday. Other speakers include House Minority Leader Nancy Pelosi, party interim chair Donna Brazile and a group of mothers whose children have died from gun violence or in clashes with police.